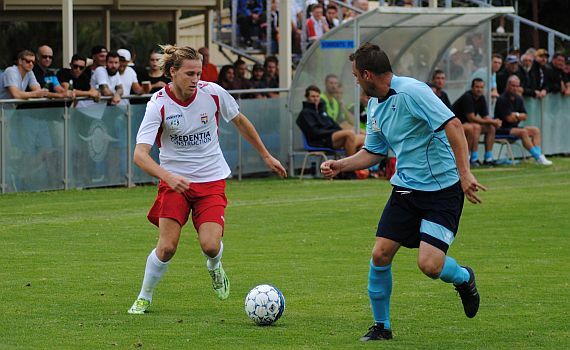 ECU Joondalup have begun their PS4 National Premier League WA season with a 0-2 loss against local rivals Sorrento at Percy Doyle Reserve on Saturday afternoon. Second half goals from Alex Morgan and Sean Canham won it for the Gulls, while Tommy Amphlett and Josh Booysen had the best chances for the Jacks. New Scottish striker Gordon Smith was out for the opener, with two yellow cards in the Night Series, which the club were unaware of, but the former Hearts striker had to take his place in the stands at kick off. McCulloch gave debuts to Steven McGarry, Joseph Jones, McGarry, Harley Orr and David Keenan, while former players Oliie Annis, Henry Durr, Josh Booysen, and Steven Walmsley made their return to the senior side after returning to the club in the pre-season. The Jacks went close after only two minutes. Durr played Orr in down the right, and he put Amphlett into the box, his low cross beat everyone, and McGarry sliding in at the back post couldn’t get a touch to it. The home side also went close on 25 minutes, Brad McDonald’s in-swinging corner was cleared off the line by the alert Coire McGuigan. It was a tight game and Booysen’s shot on the turn flashed wide of the upright. It was the best period of the game for ECU and Jones shot on the run was deflected wide. From the resulting corner McGarry shot flew over the top. Both sides had late chances. First Jacks keeper David Keenan produced a stunning save seven minutes before half time, reacting superbly to push Steve McDonald’s over the top, before in stoppage time Jones’ header whistled just past the post. ECU opened well after the break and Amphlett eased past his marker and went one-on-one with Sorrento custodian James Morgan, but the keeper stood tall to deny him. But on 57 minutes Sorrento hit the front. A corner from the right by Niccolo Sabatini wasn’t held by Keenan and Alex Morgan was on hand to fire home. Put the points were wrapped up in the last minute. Sorrento won a free kick, 20-yards from goal, and Canham stepped up to find the top corner to give them the points.